The contacts are one of the necessary things in Android smartphones. 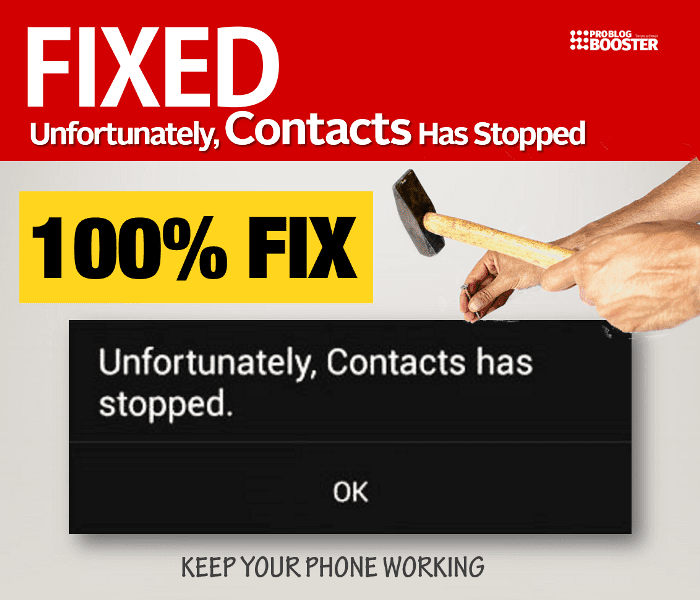 However, "Unfortunately Contacts Has Stopped Error on Android" error is most common on Android devices. You will see this error not just when you tried to receive the phone call or open the phone app, but also when you are not even using call function or try to search contacts. It's quite annoying at times when you need it most and it keeps popping up on the screen again and again. In this article, I'm going to explain the quick solutions for the most possible reasons that cause the error. Here I've listed a few steps below which will help you fix the error Unfortunately Contacts Has Stopped on Android quickly. [SOLVED] "Unfortunately Contacts Has Stopped"
Search and tap ‘Contacts’ option. Click on ‘Clear data’ button. Navigate back to applications list. Now, search and tap ‘Contacts Storage’ option. Please note: Before implementing this method, please take a backup of your data like contacts, images, any other personal data etc. Because this is one of the last tries to solve such errors. Navigate to ‘Backup and Reset’ option. Under ‘Personal data’ section, tap on ‘Factory data reset’ option. Tap on ‘Reset phone’ button. After Restart, you will find your phone get reset and no data will be present on your phone.